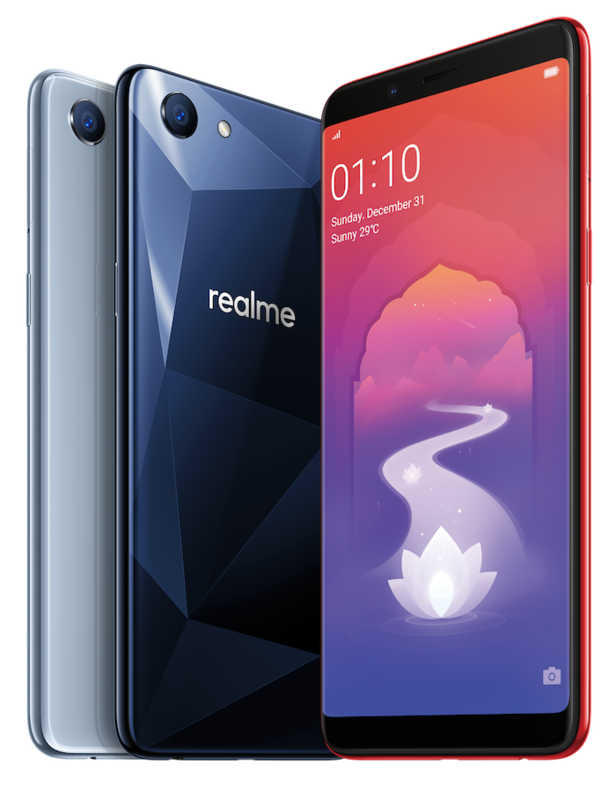 Earlier today in a partnership with Amazon India, OPPO has launched “Realme 1”, the first phone under its new sub-brand “Realme”. The Realme brand targets the Indian youth and focuses on online buyers who buy products through eCommerce channels. The Realme devices are ‘Made in India’ that aim to offer high-quality smartphones in the sub-Rs. 15000 price range. Speaking of Realme 1, it features a diamond black design that resembles the glossy diamond-cut pattern as seen on the Oppo F7 and Oppo A3. However, there is no presence of the notch on Realme 1 unlike the duo offerings from OPPO. The Realme 1 features a glossy back and patterns of different sizes that produce a diamond-like effect as the light reflects from different angles. It sports a 6-inch Full HD+ IPS display with a resolution of 2160 by 1080 pixels and a screen-to-body ratio of around 85%. The device is powered by an Octa-Core MediaTek Helio P60 12nm processor clocked up to 2GHz and runs on ColorOS 5.0 based on Android 8.1 Oreo. Under the hood, there is 3GB, 4GB or 6GB of RAM depending on the variant with storage ranging from 32GB, 64GB and up to 128GB. The storage can be further expanded up to 256GB using a dedicated microSD card slot. The device packs a 13MP rear camera with LED flash and an 8MP front camera for selfies, both with a f/2.2 aperture. The rear shooter features AI Scene Recognition while AR Sticker function is supported by both the front and rear camera. The integrated Face Unlock feature is said to unlock the phone in 0.1 seconds but it lacks a fingerprint sensor. In terms of connectivity, there is dual 4G VoLTE support (nano + nano SIM), dual-band WiFi 802.11 ac, Bluetooth 4.2, and GPS. It comes equipped with a 3410mAh battery. Measuring 7.8mm in thickness, the phone weighs 158g. The 3GB RAM with 32GB storage variant of Realme 1 is priced at Rs. 8990 in India while the top-end variant with 6GB RAM and 128GB storage costs Rs. 13,990. Both these version will be available in Diamond Black and Solar Red colour starting May 25th on Amazon India. However, the 4GB RAM variant with 64GB storage will be available later in June in Moonlight Silver and Diamond Black at Rs. 10,990. A free screen protector and case comes bundled. Realme 1 buyers can also avail No Cost EMI on Amazon.in, 5% cashback on SBI cards, Jio benefits worth Rs. 4850, and Amazon Prime delivery on their orders. Oppo Realme 1 seems to be a great smartphone in budget price point. The only thing that it lacks it FINGERPRINT SENSOR! Anyways let’s see what Realme 2 or the upcoming phone will feature.